Fibre optic sensor technology developed within City’s Department of Electrical & Electronic Engineering in collaboration with Edinburgh Napier University, has enabled Sydney Water to undertake long term monitoring in the harsh corrosive and biofouling conditions of Sydney's sewers. The collaborative research project focussed on the development of a new class of photonics-based humidity sensors for Sydney Water’s use in the management and rehabilitation of deteriorated concrete gravity sewers and corrosion at treatment facilities. 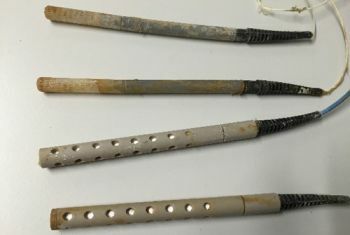 The two UK universities produced sensors with specialized, tailored coatings designed specifically to operate under the highly biofouling and corrosive conditions in Sydney’s sewers. As a result of this successful research Sydney Water will implement these sensors in a number of selected sewer locations and the findings will contribute to the future design of sewers. 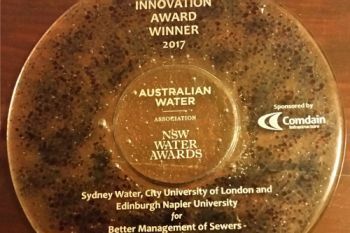 “We are delighted that our work with Sydney Water has been recognized with this Research Innovation Award at the recent Australian Water Association Awards Ceremony in New South Wales. Our innovative fibre optic sensor technology, designed for and deployed in the city of Sydney, has enabled Sydney Water to undertake long term monitoring in the harsh corrosive and biofouling conditions of the city’s sewers, offering major savings in terms of management and maintenance of this critical asset. Through its international strategy, City is committed to applying its research in problem-solving in situations like this, operating wherever the issues arise. The Australian Water Association is the national peak water organisation, delivering information, expertise and collaboration for sustainable water management. Its membership includes professionals and practitioners working in utilities, science and research, energy and resources, manufacturing and agriculture. It has an active branch network across all Australian States and Territories and maintain extensive international links, including with the International Water Association. The AWA Awards ceremony took place in St Leonard’s, Sydney, on Friday, 10th March 2017. A humidity sensor (or hygrometer) senses, measures and reports the relative humidity in the air. It therefore measures both moisture and air temperature. Relative humidity is the ratio of actual moisture in the air to the highest amount of moisture that can be held at that air temperature.